for under 1¢ per household! The best value is and should always be based on return on investment (ROI). We had this in mind when we developed Any Door Marketing Marriage Mail Program for the advertiser and consumer. The key to being the best value was to "Leverage Partnerships with Local Delivery Experts and the USPS for a 1 of a Kind Strategic Delivery System that lowered print delivery to EVERY DOOR in the market at a lower cost than had ever been done before. 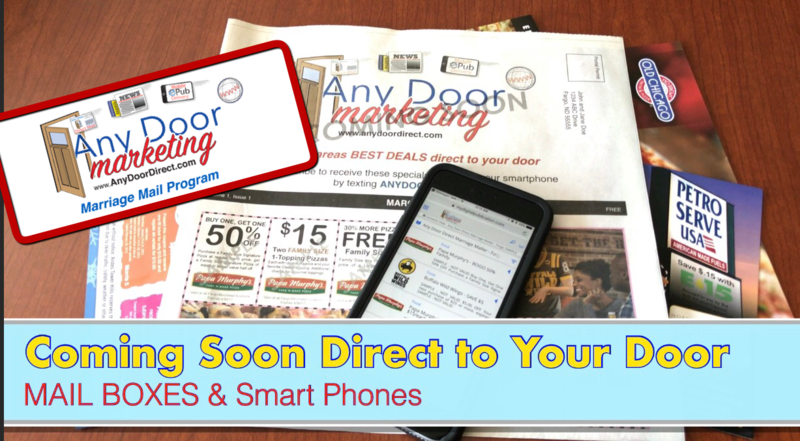 Along with home delivery of your advertising message to all consumers and buyers of products and services in your area, we also have the option for consumers to receive a free mobile smartphone version of Any Door Marketing Marriage Mailer Area's Best Deals by simply texting to opt in. In our fast moving mobile society we knew it was essential to include a user friendly mobile option for even higher redemption rates to the advertiser. We knew we needed an extraordinary way to lower print and delivery costs, lower than anyone in the market place, so the advertiser has extra money in the budget for an online boost as well. Thats right, you can get print, mobile, and online for the lowest price you have ever seen. As an option we can digitize and contextualize your campaign and load online to help boost your companies URL ranking and update the major online directory as well. All this for as low as 1¢ per household. Many other FREE Value Added Options. ​Contact Us for the Exciting Details & Rates ! and want advertising rates or have questions, please click the contact button below.